Welcome to The Quilting Connection!! We are thrilled to announce that for the 8th year in a row we have received the esteemed Handi Quilter Way Award AND the Handi Quilter Top Sales Award! This would not have been possible without the ongoing support of you, our amazing customers! You sharing your experiences with your family and friends, has helped grow our business to heights we never dreamed possible! Thank you so much from the bottom of our hearts! On this website, you will find a full selection of some of the best longarm products on the market including The Quick Zip System, Handi Quilter accessories & gadgets, and much more! 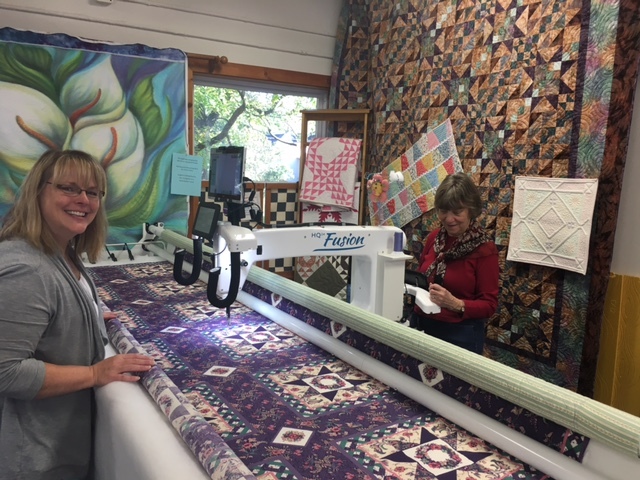 What's New at The Quilting Connection? We have the New Handi Quilter HighLight Kits installed at both of our stores and LOVE the extra light! We also have the secret drawers and those can hold so many supplies! We can't wait to see what new items Handi Quilter comes up with! Make sure to join our Newsletter! Thank you so much for visiting our website! Please let us know if you have any questions!